Treasure, ruins, and myths are about as good as it gets in archaeology, and mystery is omnipresent, but of course none of these things interest professional archaeologists, not one bit, not at all. Archaeologists value things that are more rare and precious than treasure. To find somebody’s best belongings stacked in a tomb is not that uncommon, but to find them in the space where they belong and interacted with their owner is extraordinary. The chance survival of built environments, complete with contents, is probably the most valuable type of archaeological find imaginable, and luckily, it has happened a number of times. Volcanoes are probably the best agency. Eruptions are usually fairly sudden, and people often escape, but invariably leave most of their possessions behind to be entombed in volcanic ash. 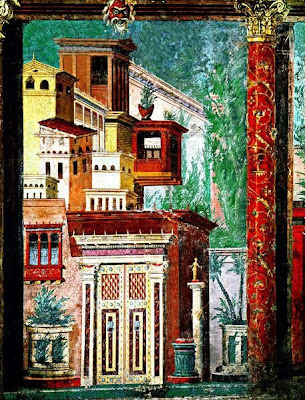 Pompeii and its neighbour Herculaneum, buried by Vesuvius in AD 79, is the best-known example. We have the eyewitness account of this eruption written by Pliny the Elder (Gaius Plinius Secundas), a Roman official and author, who later died in the eruption, probably while organising the naval rescue of trapped inhabitants. The remains of buildings, their contents, and even some unfortunate occupants and their pets, represent a time capsule of the material world of AD 79, giving archaeologists an unprecedented ‘context’ with a calendar date, and hundreds of thousands of finds that belong together. 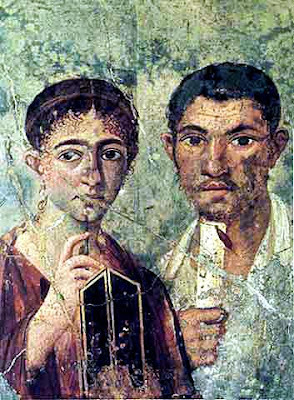 At Pompeii, not only do we a have house with its contents and decoration remarkably preserved, but also we may have the names of the owners, whose taste and status it reflects. We can glimpse a wealth of biographical details and find tantalizing evidence of their personal history, social interactions, and business life, and we may even have their portraits. Many of the quality buildings in Pompeii have walls with frescoes, where the decorative designs and pictures were painted directly onto the walls when the plaster was still wet. They feature mythical and historical scenes, landscapes, portraits, and a wealth of visual detail of a world long since past. In their portraits we can see the house’s occupants as they wished to be perceived, and we are able to see how they chose to decorate their walls. Pompeii’s frescoes have given us an extraordinary sample of visual art from nearly 1500 years before the Sistine Chapel was painted. The Roman period is historical, so we have many other sources of information, and this allows us to understand what the images portray, and interpret their meaning fairly confidently. 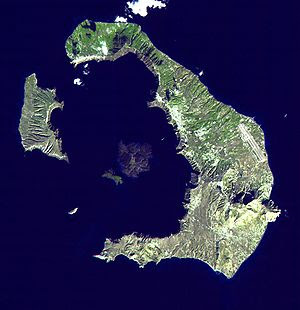 The eruption of Vesuvius occurred near the centre of the Roman Empire, in a time we know much about, but 1700 years earlier, in the Bronze Age, a volcano on the island of Santorini (Thera) in the Aegean had quite literally blown up, taking a lot of the island with it. The eruption was a catastrophic event for Santorini’s Bronze Age inhabitants, and the resultant tsunami and ash cloud may have had a wider impact in the Eastern Mediterranean and beyond. But as at Pompeii, it buried and preserved a town. 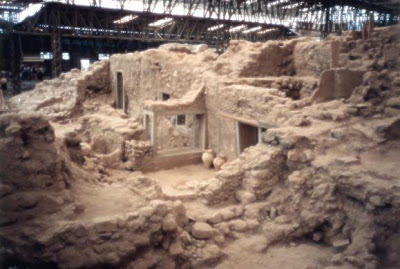 In 1967 the late Professor Spyridon Marinatos excavated a site at Akrotiri on the island, uncovering the southern tip of a large town, with streets, squares, and buildings that survived up to 8 meters high. The inhabitants’ material culture is known to archaeology as ‘Minoan’, an important trading and sea power that flourished in Mediterranean at the same time as Ancient Egypt. 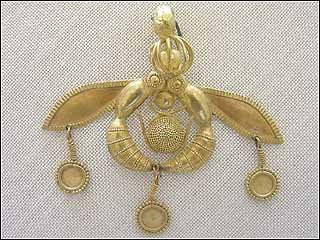 It was quite unknown before excavations conducted on the north coast of the Island of Crete at the end of the 19th century by British archaeologist Arthur Evans. Following work by a local archaeologist, Minos Kalokairinos, Evans unearthed a huge palace complex at Knossos with over 1000 rooms. He coined the term ‘Minoan’ for this culture after the mythic king Minos in Greek myth. The Minoans ticked all the boxes for a ‘lost’ civilization: impressive architecture, un-deciphered writings, unknown language, fabulous wall paintings, beautiful objects, and a clear connection with the early myth and cultures of Greece, 1000 years before the Classical period. Knossos, and other palaces and villas excavated subsequently on Crete, had already demonstrated the quality, beauty, and abundance of Minoan material culture, but as at Pompeii, Akrotiri was a ‘provincial’ town, and its occupants not obviously aristocracy. Among the buildings at Akrotiri were warehouses, workshops and private houses, some surviving three stories high. The town, dated from 2000–1650BC, had mains for drainage and water, and may have had piped geothermal hot water. 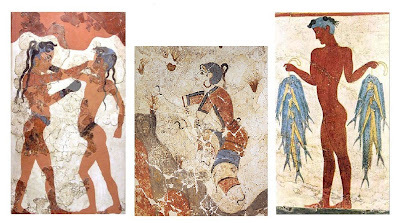 Some of the walls of the houses had been decorated with frescoes, featuring secular and more informal scenes than the religious and ceremonial themes found in Minoan places. At Akrotiri we can see a detailed representation of boats, travelling between two towns across the sea, accompanied by leaping dolphins, while ladies sat in the shade of canopies. Another fresco shows women collecting saffron, probably for use as a dye. These pictures give an insight into dress, hair styles, objects, and activities that are otherwise completely invisible to archaeology. Among other famous scenes are young men boxing, and a fisherman with two strings of fish strung by their gills. Some frescoes have map-like qualities, and there are visual references to plants and animals from all over the Eastern Mediterranean. Figurative art can be difficult to interpret in a culture we don’t fully understand, and determining whether a scene is symbolic, mythical, or documentary in nature is not always straightforward. Minoan art uses different visual conventions to convey space and distance than we use today. The relationship between figures and their background, similar to ancient Egyptian conventions, is very different from the modern concept of ‘perspective’ in art, in particular the use of ‘cavalier perspective’, where figures are shown in profile against a background shown in plan. 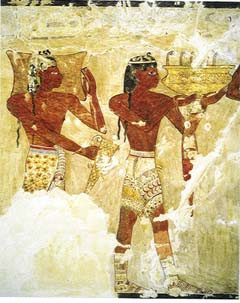 Remarkably, Egyptian wall paintings from Theban tombs show figures with appropriate dress and hair, carrying gifts, including distinctive Minoan metal ingots, who are referred to as coming from place named "Keftiu", probably Crete. 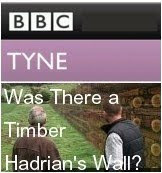 This is an interesting example of one of the many thousands of connections made between archaeological sites and cultures on the basis of comparing pieces of material culture. These connections are fitted into our knowledge of pharaohs, kings, priests, and their interactions, gleaned from writings and inscriptions detailing dedications, successions, reigns, and dealings with other powers. Notwithstanding the considerable difficulties in reading and interpreting ancient scripts, languages and calendar systems, written records and material culture have been meticulously combined to create a relative dating system for the ancient world. Dates have been arrived at by adding together periods of time, such as reigns, but truly fixed points are difficult to come by. Things can get difficult when you start trying to put ‘real’ or absolute dates onto the system. 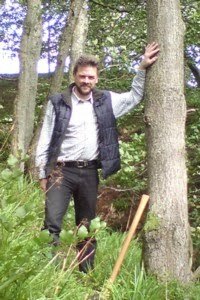 Radiocarbon dating, although much improved, gives a date range rather than an exact date, and the only truly chronological system is dendrochronology, which counts back and compares annual growth rings in wood. If a sequence of ancient local timbers can be assembled and linked to the present day, a pattern of annual growth rings can be defined that will allow you to match other pieces of wood to the pattern, dating them very precisely. Minoan sites like Knossos were rebuilt and modified over a very long period of time, so that what precisely belongs with what becomes harder to understand, which is why sealed archaeological ‘time capsules’ with a sudden end, like Akrotiri, are invaluable. Archaeologists realised that such a big volcanic eruption must have left its mark elsewhere, and that it may be datable through scientific techniques. Thus, the possibility that the eruption could form a very early fixed date in our chronologies has prompted a significant number of investigations in the last 40 years. To cut a 3700-year-old story short, radiocarbon dating, dendrochronology, and analysis of volcanic dust in ice-cores has arrived at a date for the eruption at Akrotiri of about 1650--1600 BC, perhaps 1627/28. In the established ‘conventional’ chronology, this is at least a hundred years too early, and a date nearer to 1500 BC would have been preferred. Since most chronologies are linked, ultimately, back to Egypt, the implications of an early date are almost as cataclysmic for contemporary archaeology as the original eruption was to the Minoans. There is now something of a standoff, as, not for first time, scholarship tries to stare out the men in white coats, and wonders where it’s going to find a spare century or more of ancient history. The archaeology of this small island in the Aegean was vital to understanding the wider nature of Minoan civilisation, and may yet may prove the key to a fundamental rethink about the precise chronology of the ancient world. And if that were not enough, Thera may have been the inspiration for the mythical city of Atlantis. The Athenian writer and philosopher Plato, writing in 360 BC, introduced the idea of the ancient civilization of Atlantis into western literature, claiming to have learnt the story from Egyptian priests. It was a contentious story, disputed in ancient times, and has prompted much speculation ever since. Archaeologists never take any ancient literature at face value, but most are prepared to admit many ancient stories have some kernel of truth, distinguishing them from the nuts who treat such things as true. However, much of what is inherent in Plato’s description of Atlantis could be applied to Santorini and the Minoans, and many archaeologists have argued for this link. The ruins of Akrotiri are a real archaeological treasure. All too often archaeologists study the things that people threw away, while the material aspects of peoples' lives they valued most, like their homes and their art, are lost to us. Furthermore, in their domestic art we can glimpse non-material aspects of their lives that they valued. The buildings at Akroteri give a vivid insight into the lives of ‘ordinary’ people, reminding us that behind every successful culture, there are numerous successful individuals, who, like their leaders, seek to express themselves and their experience through art and architecture. It is in the details of these lives that we gain a more balanced understanding of a culture. Archaeology can be like a jigsaw with no picture on the box and most of the pieces missing; but just occasionally someone finds a big bit that fills in a lot of the picture, and you realise that the bits you already had did not fit together in the way you thought. A geological perspective, and a brilliant book that I heartily recommend. 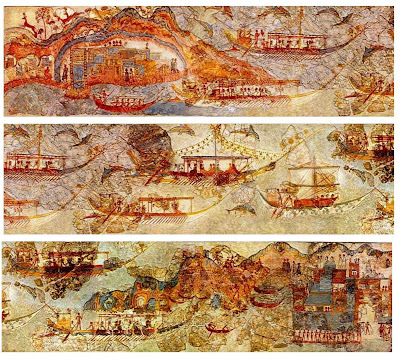 Do you know where I can get a high resolution copy of the Fresco from the West house at Akrotiri, showing a procession of boats -- I work for a small Greek American magazine, and I'd love to include the image in our article about the "lost city of Atlantis" and the theories about it being in Santorini. Could you contact me at toni dot milak at gmail dot com -- I'd really appreciate the help!